Quite apart from its obvious physical dimension, contemporary dance is invariably a touchstone for truths and notions from the worlds of philosophy, art, history, metaphysics, politics and whatever else a choreographer might wish to draw on as material. Claire Cunningham’s Give Me a Reason to Live is rich in resources, leading you into her landscape of preoccupations that range from the nature of sin, empathy, faith, the visibility of minorities, the depiction of cripples in the paintings of Hieronymous Bosch, Nazi euthanasia of the terminally ill and disabled and the consequences of our present government’s welfare reform. Of course all this is not readily apparent in the performance; you have to dig to find what informs the movement, but without it Give Me a Reason to Live would not be the powerful polemic it is. 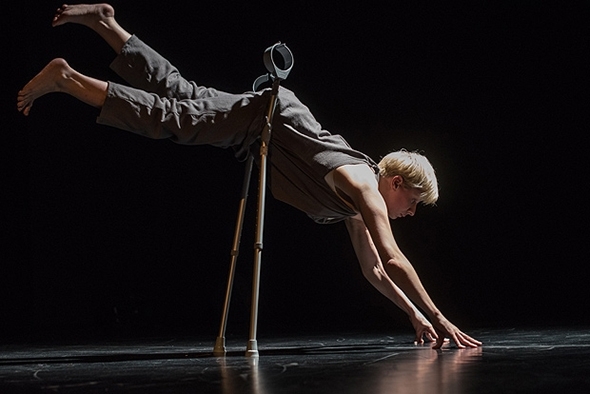 Cunningham does not have the range of movement of an able-bodied dancer — she suffers from a debilitating form of osteoporosis — but what she does with her crutches and her limited movement is to directly embody her ideas, to live them on stage and because she knows what she is talking about she evokes a visceral response. When she strips off her outer clothing and lays her crutches beside her to stand unaided, there is no pretense. It is a physical and mental struggle that she experiences in real time and she succeeds through sheer willpower until she can endure it no more. What differentiates this naked physical act from the intention behind it is that landscape of preoccupations I mentioned earlier. The word ‘understand’ has the meaning to stand under, or support. Cunningham’s test of endurance is not about her but about what she stands for, about who she supports. She is standing for the countless victims whose disabilities relegate them to the invisible margins of society or worse. Remarkably Cunningham achieves all this through dance. Standing is but one of the images she invokes on this journey. When we first see her she is slowly extracting herself from a corner as if she had been placed there by history, leaning forward on her crutches as extensions of her arms against the walls. A shard of light (from the palette of Karsten Tinapp) illuminates a thin sliver of her body from head to foot, as if sunlight were falling through a high rectangle of light (the harsh angles in Daniel Liebeskind’s Jewish Museum in Berlin come to mind). Another ineffable image is her rocking gently forward and falling back balanced on her crutches (see photo) to the hauntingly fragile Nesciens Mater by Jean Mouton, after which she slowly collapses to the floor in the form of one of Hieronymous Bosch’s spindly cripples (‘a distorted symbol of human baseness’), crutches at her side. But the final image, the one to which all previous images seem to lead both physically and spiritually, is Cunningham as a Christ-like figure suspended on her elongated crutches braced against the back wall singing (yes, Cunningham trained as a singer before finding her vocation in dance and has a beautiful mezzo voice) Bach’s Cantata BWV 4, Verse 2 with a breathless purity that crowns the journey she has undertaken in light. no innocence was to be found. held us captive in his kingdom. How do you pair this extraordinarily rich 35-minute work with another without detracting from it in any way? Dance Umbrella’s artistic director Emma Gladstone’s decision to open the evening with Israeli choreographer Idan Sharabi’s Ours is a stroke of genius. On the surface Sharabi’s male duet to songs of Joni Mitchell is funny, engaging and superbly danced by himself and Dor Mamalia, but its central question of what is ‘home’ in Israeli society has a profundity and a vulnerability that shares Cunningham’s preoccupation with invisible minorities and the duet’s suggestion of homosexual love — ‘our little opportunity to find our home together’ — takes on political significance in its context of a strongly homophobic society. Sharabi and Mamalia don’t dwell on this but simply embrace it with tenderness, compassion and a sense of humour that draws the audience in to the work’s humanity. But there is perhaps another, more insidious connection between the two works: hovering in the air between Ours and Give Me a Reason to Live is a commentary on the ever-present spectre of persecution.